This morning I woke up in Hayward to somewhere between 12 and 15 inches of snow blanketing anything that didn’t move out of its way. I grimaced when I spotted the huge white mound in the yard, last I knew, that was where I left my car. This surely was going to be a three-cup coffee morning. I tell you, nothing, not even my strongest coffee, was a match for the bitter, blowing, icy conditions I battled while reclaiming my car from Mount Iceball. My car fought me every step of the way……New swear words formed on my lips, and promptly froze there, as my icy fingers pried at the doors to get in. I put the key in the ignition after wearily shoveling endless amounts of snow off the car, and the starter stuttered before abruptly deciding to fire up. Whew! My little car groaned as I drove over the jagged snow-covered driveway. Strange cracking and bumping noises from the undercarriage had me questioning my decision to drive to the gym in this God-forsaken weather. I doubted the roads would even be passable so soon after this huge storm – perhaps I should of waited a while, given the road crews more time. I was relieved to find the main roads plowed, even though they were still covered with a solid layer of ice, generously garnished with sand, and constantly dusted with blowing snow. As I drove towards Hayward, I couldn’t help but notice how different people were driving compared to back home in southern Wisconsin; here, everyone drove slowly, cautiously. Never did an impatient driver drive right up to my bumper, never did I have to worry about someone blowing past me at breakneck speed and wondering if their stupid maneuver would send me into the ditch. The drivers in Hayward, on this morning after a major snowfall, were refreshingly considerate towards others on the road. Back home, drivers seem to always be in a hurry. No matter what the weather or road conditions are, seldom do they vary their rapid pace. Why did the Hayward people drive so reasonably after a storm? Could they of slowed down because they noticed the extraordinary winter scenery? I think this is conceivable, after all, what I saw could not be ignored. 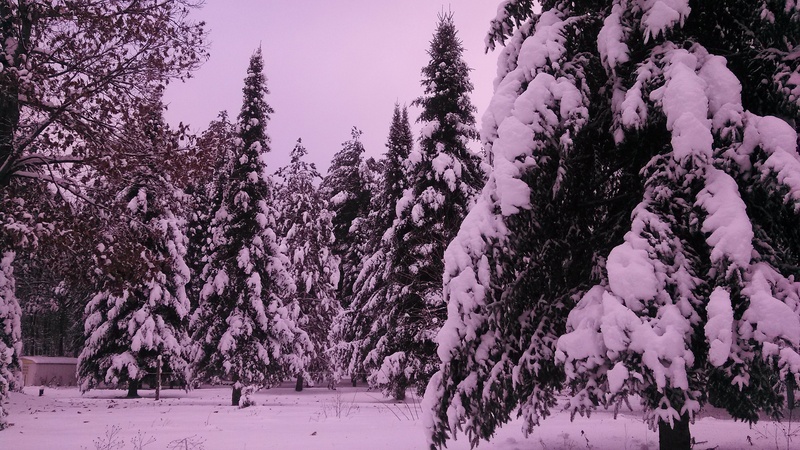 Any picture I took could not of possibly captured the pristine beauty of the freshly fallen snow on this northwoods landscape. The ice on the bare tree branches sparkled in the morning sun – each tiny, forgotten, drab, twig had for a short time been given the gift of splendid shimmering life. The magnificent, regal pines flocked in silvery-white snow, their tired branches leaning downwards, as if trying to dislodge their heavy burden. The sight of it all was so vivid, so breathtaking. Did my fellow motorists slow down to gaze at this magnificent spectacle created by Mother Nature? Were they mesmerized by the natural beauty in this northwoods backdrop, as was I? I think so. 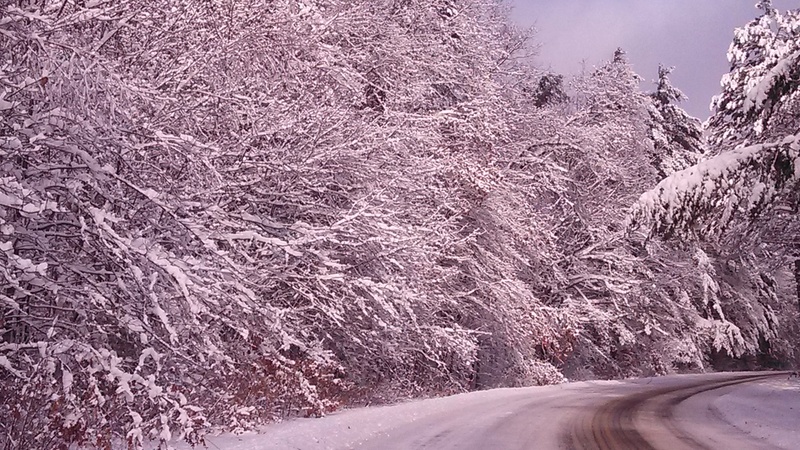 This driver is not in any particular hurry to leave this beautiful winter wonderland, at least not on this morning. 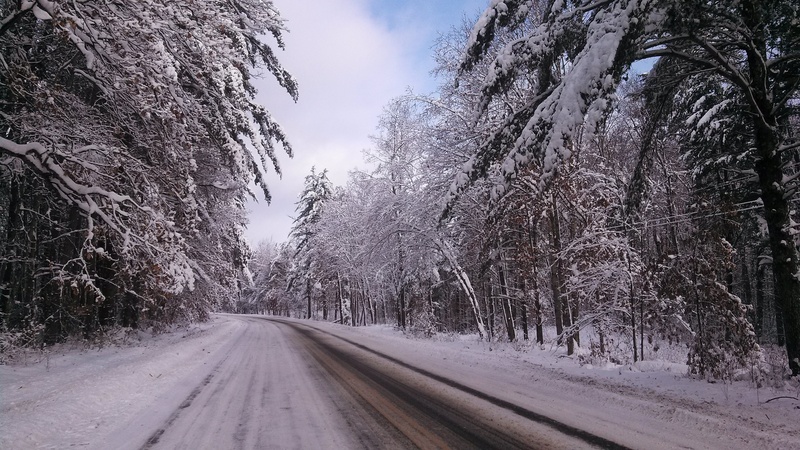 This entry was posted in NORTHWOODS LIFE, Scenic Observations and tagged cathy lareau, Hayward, Hayward WI, pine trees up north, road conditions Hayward, snow storm hayward, winter driving, winter in Hayward, winter roads Hayward WI, Wisconsin. Bookmark the permalink.